The Sanctuary was overflowing this week with comforters and boxes filled with health kits, school kits and layette kits. These comforters and kits reflect the work over the last year of two of Messiah’s long running ministries. The comforters, led by Annette Joens, meet each Tuesday at Messiah Lutheran Church. They create the hundreds of the wonderful quilts like the ones seen in this photo. 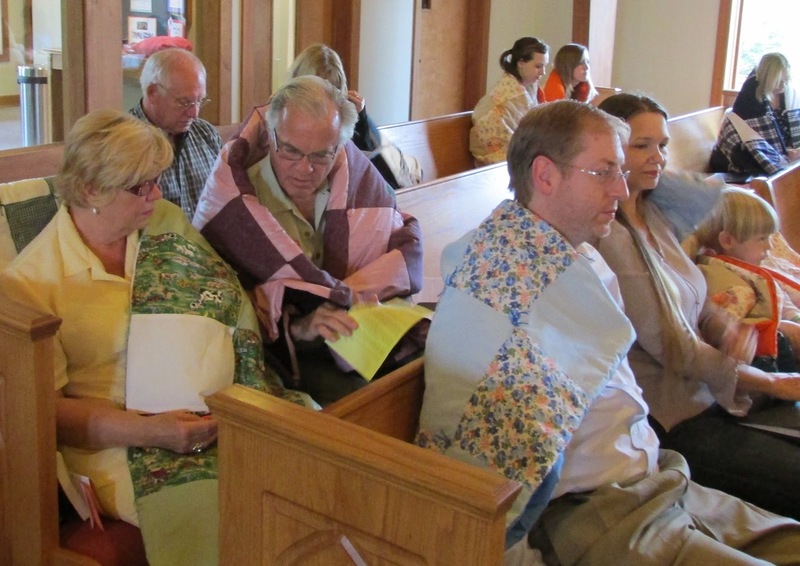 The quilts and prayer shawls created by the comforters are sent to those in need both in the local community and around the world via Lutheran World Relief. Rhonda Gaede leads the Kit Ministers. This group collects, assembles and boxes thousands of health kits, school kits and layette kits. These kits are sent around the world to those in need via Lutheran World Relief. During our worship service, we wrapped ourselves in the quilts that were made with love and that we are sending in love in hopes that they will provide comfort to those in need. Both of these ministries are looking for helping hands. You don’t need any special training or skills. Just a willingness to help. If you would like to learn more about how you can help these ministries, please contact, Annette Joens, Rhonda Gaede, or the Church Office at (256) 721-0041 or info@mlutheran.org.